← there goes another one. …a big fan of Martha Stewart. She seems to be slowly monopolizing the craft industry, and I can’t seem to avoid her. She’s everywhere — no joke! It’s like she’s following me because I’m not a fan. Anyway, I gave into her monopoly and bought more Martha Stewart punches. *cough* I mean EK Success punches *cough*. I know that I shouldn’t have bought them, but I did. On top of those punches, I fell further into the Martha hole because I’m waiting on a package with one of her products. I’ve been looking for one of her products since it was released, and I finally found it. Gloria bought it for me as one of my early birthday presents. Now before all of you Martha fans start to get on my case, don’t get me wrong… I don’t hate the woman. It’s just when I see her on TV, she’s usually not the one “crafting”. One of her guests is usually showing her how to “make this” or “do that”. …and her magazine, does she really come up with the ideas in there? I would think that people are submitting ideas and projects for her to publish. I squeezed in some time to create a couple of layouts to share. I busted out some of the latest from Cosmo Cricket. This first layout I totally LOVE because I love this girl. It was good to see her at CHA, and I was so happy that we got to go out to dinner together. Julie, it was good seeing you again; we need to to do it again real soon! …and I created this cute little Valentine’s box that I filled with chocolate. Where’d I get that paper?! Well, that right there, is Kiki Art. Aren’t the bright colors tons of fun? Are you looking for Kiki Art paper to play with?! Check out the blog for a growing list of stores that carry these products; the full list of stores is still under construction. If your local scrapbook store isn’t listed and you want them to carry Kiki Art, let them know! I told my local store about their products, and guess what?! An order form is in the works! Okay, I’m going to wrap this post up because Hilo is nagging me to play with him. Besides, LOST is on TV tonight. I can’t wait! PS: To you — stay safe in the snow storm and make sure to stay warm! Love the los! BTW~ I cant wait to met both of you :)! I gotta admit that I love her punches…the doily ribbon is my fave, the butterfly punch a close second. Love your projects! Cute candy box and cute Julie! 🙂 Hugs! Martha WHO?? Oh, you mean the name that is on ALL of my punches?? LOL!! If only I would get my new Cosmo then I can BUST it out like you did, so so so lovely!! and GO MAUI!!!!!!!! I have also given into the martha curse… I am not a fan of the prices. I bought the daisy punch. I hope you have a good rest of your week! martha martha martha. only in a capitalistic society does a person go to jail for insider trading and comes out a bigger millionaire than before. hahaha. hilarious. anyway, i love the LOs and projects. Can i tell you that it is still snowing?! counting the days until warmer weather. Thanks for stopping by my blog! Just wanted to stop in before going to bed to say Angel is home :). He didnt have to be admitted like we thought. He just gave us some more meds for him to have at school. So he returns tomorrow. His peak flow went from 100 (which is low) to 250 (which is good) by the time he left his doc office. He needs to stay above 200 and he will be good. It’s always awful to cave in isn’t it?! I feel the same way about Walmarts. I REFUSE to go into them, but recently HAD to because it was the only box store I could find. I almost cried when making my purchase…LOL. I’m sure your punches will be worth it!! Winter Lodge! I had input into that layout! All these Red Oak Line fans and followers… I was commenting on her LOs way before this blog was started! Remember that crabbing LO with the crab holding the sign Ya’z? LOL! scott — don’t remind me about that UGLY layout. it’s as ugly as the beast! bwech. 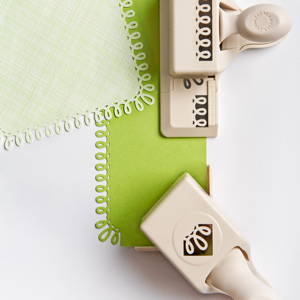 oh my my my… I LOVE that loopy loop martha stewart punch!! where did you get it?? That’s a “gotta have”.. I agree with you.. not a huge martha fan since she did time and all but she does have some cute stuff once in a while. Hey wait.. i was re-reading my comment and some of it is missing.. I said.. I love your layouts especially the one of you and Julie.. It is so A-DOR-ABLE .. the middle part got cut out somehow. oops! Cute, cute, CUTE! Especially loving the LO with you & Julie… adorable! I’m glad you finally got your hands on that border punch. Even better…. it was a gift! Gotta ♥ that! 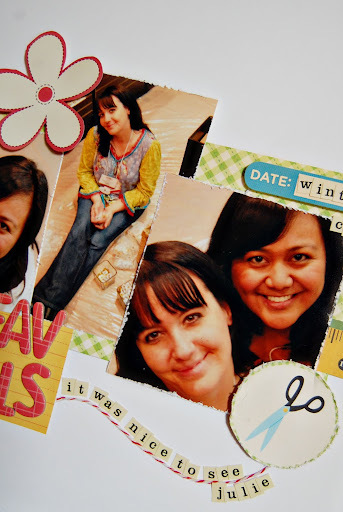 Great projects…love the Kiki box!!! omgosh… i totally agree about martha stewart!! i really dont like her stuff but i have been tempted to buy her punches bc it seems like theyre everywhere. anyway… way love your lo’s as usual… awesome work!!! i cant wait to see your new layouts using your new punches…and i love the layout of you and julie…as always, you did such a fanstastic job! katrina — oh my word! are you serious?! booooo!!! how could you even?! LOL. jk. it’s like i’m forced to like that damn woman. i HAVE to use her stuff because i work in this darn industry. bottom line — i try to avoid buying her stuff cuz i’m not a big fan of big corporations. …and g won’t mind about the chocolate at all… besides, i’ll prob make her expense some dark chocolate on her trip to bring home! 🙂 LOL. Lol re. Martha, I’m not a big punchy fan in general, but I think thats just because they’re expensive and I’d rather spend $$ on pretty sprays and paints 😉 That doesnt stop me, however, from playing with all my friends when I get the chance! Gorgeous creations, especially LOVE your Cosmo page, and jealous that you’ve met Julie, she’s got to be the most super sweety around! And thanks so much for the blog luv!! I’m totally with you on MS!! I swore up and down she’d never get my money, never, never, never. I just don’t like what she stands for, ya know? But then, geesh, that button punch I just had to have. Then that stinking border punch (which, as you know, I finally figured out how to use, though it’s a pretty dumb punch if you ask me). Anyway, enjoy your punches…oh, and love the latest stuff! 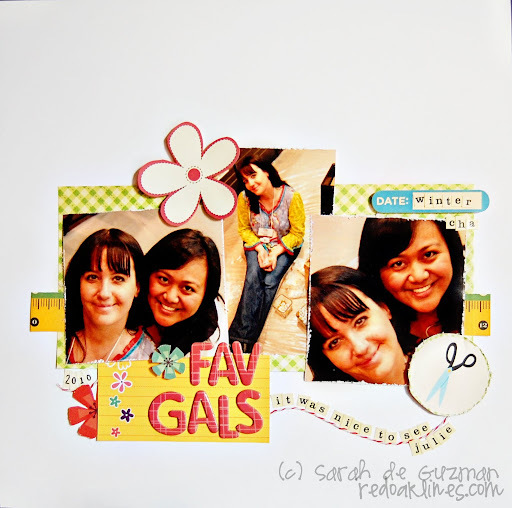 Great layouts, Sarah! Thanks for stopping by my blog for the Create It Green blog hop. as for your lo’s… too too too cute… love the fav gal one… hmmmmmm is that julie??? tee hee! the box is fab- – girl, just fab!!! and the winter lo… so adorable!! !